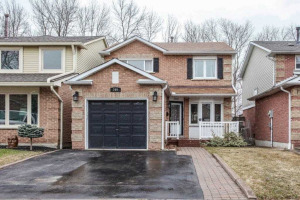 This Well Maintained 3 Bedroom, All Brick Bungalow Is Close To Highways 407 & 401. The Main Floor Features An Eat-In Kitchen, Combined Living & Dining Room With Large Picture Window & 3 Good Sized Bedrooms. The 3rd Bedroom Has A Walk Out To The Back Deck Overlooking The Fenced Backyard Which Has A Patio Area And A Storage Shed. There Is A Separate Entrance To The Finished Basement Which Has A Large Rec Room & An Additonal Bedroom With A 2Pc Ensuite. Close To Parks, Schools, Library, Community Centre And Public Transit. Include Fridge, Stove, Washer & Dryer, Blinds & Window Coverings. Exclude Freezer.